Original Vintage Sewing Machine Parts - Sewing Machine Repair Book Coming Soon! 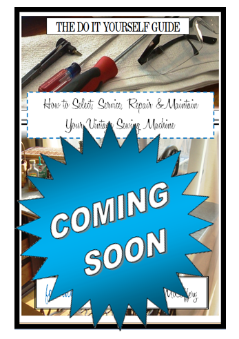 Sewing Machine Repair Book Coming Soon! Finally a Sewing Machine Repair Book for the Home Sewer. This book focuses on vintage sewing machines pre-1960, and will tell you how to select, service, repair & maintain your vintage sewing machine. Packed with easy to follow instructions, pictures, and information, this book will guide you in servicing your own sewing machine with confidence. I'm looking forward to reading your book and your blog. We're just learning about vintage sewing machines. We started with a Singer 15-30 of grandma's, husband re wired and I cleaned & oiled. Now we're hoping to get a Singer treadle stitching again this winter. Hi Michelle, thank you for your interest! I look forward to pictures of your grandmother's machine.